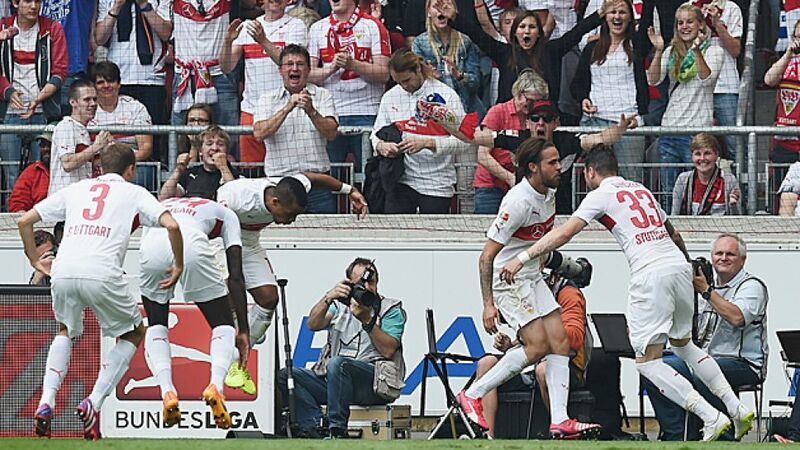 Stuttgart - VfB Stuttgart came from behind to move above Hamburger SV and out of the relegation zone thanks to a 2-1 win at the Mercedes-Benz-Arena. Gojko Kacar headed Hamburg in front in the 12th minute, but an enterprising Stuttgart side turned the tables with goals from Christian Gentner and Martin Harnik before the break. The hosts spurned a hatful of chances to increase their lead, but still got a precious three points in a dramatic relegation six-pointer. Stuttgart started well with Daniel Didavi getting in their first shot on goal, but the 60,000-capacity crowd was stunned to silence when Kacar headed Hamburg in front. His third goal in as many games was too hot for Sven Ulreich to handle with the Stuttgart custodian only able to help the ball into the top left-hand corner. Stuttgart's response was strong and Didavi tried his luck from long range with Rene Adler alert to the danger. The hosts continued to attack, gaining their deserved reward when captain Gentner swivelled 180 degrees just inside the six-yard box to thread his shot through the legs of Adler and bring Stuttgart level. Gentner fizzed in another shot which tested Adler as the Swabians continued to push forward, and they grabbed a second before half-time with Harnik on hand at the far post to lift the ball into the roof of the net to spark scenes of wild celebrations, both on and off the field. The goal lifted Stuttgart from 18th to 14th in the live standings and it could have got even better with Harnik dragging a shot wide just before the interval. Didavi again tested Adler early in the second period as Stuttgart looked to turn the screw with their fans getting right behind them. It took an excellent saving lunge from Johan Djourou to deny Daniel Ginczek a tap-in as the chances continued to come and go. The offside flag stopped Harnik in his tracks and Filip Kostic blazed over as two more chances went begging for Huub Stevens' men. The visitors could hardly muster any chances of their own, though, as Stuttgart held on comfortably to clinch all three points, even if their chase for a third goal proved futile. Kostic went closest with his shot taking a deflection off Adler and striking the crossbar, but enough damage had already been done from a HSV perspective as Stuttgart climbed off the bottom and out of the relegation zone.